Mini-Pac Gluing Fumes - Mini Pac Fumes in Gluing Operations | Air Purification Inc.
To collect fumes and odors from a gluing operation. The odors being emitted from the gluing machine were causing worker sickness and loss of productivity. 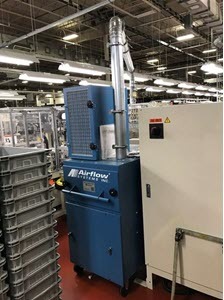 Airflow Systems model Mini-Pac with a 99.97% internal HEPA filter and external carbon module. The Mini-Pac not only collects 100% of the fumes, it also collects any harmful particulates being emitted. The customer is able to recycle the air in the area and not exhaust the fumes. The customer estimates the payback on the Mini-Pac to be less than two years with the savings being in air conditioning and heating costs.